Ph.D. in Medicinal Chemistry is a 3-year research level programme that deals into Pharmacy and Pharmaceutical Sciences. The minimum eligibility to seek admissions is a master’s degree in M.S Pharm. in Medicinal Chemistry/ Natural Products or M.Pharm in Pharmaceutical Chemistry or M.Tech in Pharm or and M.Sc in Organic Chemistry. The admission process to Ph.D. in Medicinal Chemistry course involves a written entrance test followed by final selection through personal interview. A few institutes shall offer admissions on merit and first come first serve basis. Interested candidates must prepare for NIPER Joint Entrance Examination conducted by National Institute of Pharmaceutical Education and Research for all of its institutes across India. Ph.D. in Medicinal Chemistry programme encompasses a wide spectrum of activities such as studies pursuant to research based on the interaction between drugs and toxic substances along with biological systems and relationship of chemical composition and dynamics to biological function. The total fee charged by institutions across India is between INR 15,000 and INR 84,000. Ph.D. in Medicinal Chemistry scholars from this discipline are highly marketable and receive job offers for the most competitive positions in pharmaceutical or biotechnology companies. The pay package in this discipline is highly dependent on one’s research aptitude and expertise. 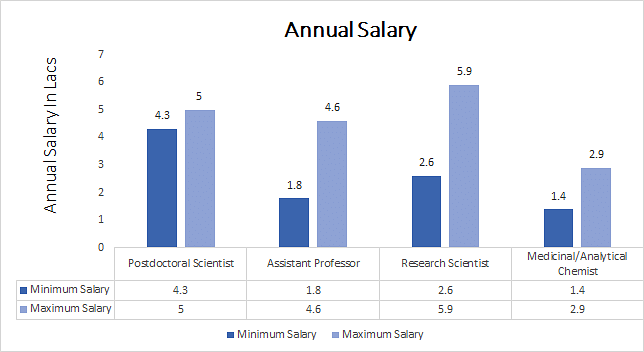 However, a Ph.D scholar is likely to get good opportunities in pharmaceutical companies with average salary between INR 2.6 Lacs – 5.9 Lacs. Eligibility M.S Pharm. in Medicinal Chemistry/ Natural Products or M.Pharm in Pharmaceutical Chemistry or M.Tech in Pharm or and M.Sc in Organic Chemistry with minimum of 60% marks. Ph.D. in Medicinal Chemistry: What is it About? Ph.D. in Medicinal Chemistry at research level involves the development of new drugs to treat diseases begins with advanced knowledge of the behaviour of chemical substances at the molecular level. Students may elect to complete research in interdisciplinary areas like bio-organic and medicinal chemistry, supramolecular & nano-chemistry, biophysical, oligonucleotides chemistry, neurodegenerative disorders, drug designing, development of synthetic methodology, synthesis of bioactive small molecules and therapeutic development for cancer. During Ph.D. in Medicinal Chemistry course work, scholars work with field experts in modern laboratories to develop, synthesize and examine drug compounds. Participants learn about the nature of chemical substances and how chemical properties affect the absorption, drug kinetics, distribution, excretion and metabolism. The research is directed towards the understanding of pharmacological actions leading toward improved drug design. A Ph.D. in Medicinal Chemistry earns you a degree, job opportunities and imparts enormous knowledge on modifying designs of drugs available in the market to more safer and effective drugs for treating a condition or disease. To pursue research level studies in Medicinal Chemistry a candidate should have a degree in M.S. Pharm. in Medicinal Chemistry or Natural Products, M.Pharm. in Pharmaceutical Chemistry, M.Tech in Pharm. or M.Sc. in Organic Chemistry with minimum 60% marks or CGPA 6.5 on 10 point scale. Reserved category candidates shall be given relaxation in CGPA to 6.25 on a 10-point scale or minimum 55% in the eligibility criteria for admission to Ph.D. in Medicinal Chemistry course. Admission to Ph.D. in Medicinal Chemistry is done on merit obtained in written test and interview conducted by the institutions. Interview of candidates will be conducted based on the merit of written test. One of the important entrances to this regard is NIPER Joint Entrance Examination conducted for admissions into all affiliated campuses. The syllabus for entrance exam comprises of one objective type question paper containing 170 questions of 85 marks on subjects like Chemical Sciences, Biological Sciences and Pharmaceutical sciences. The question paper will be of master’s level degree in the concerned subject. The paper shall also have questions from General Pharmaceutical Sciences and General Aptitude. The selection of eligible candidates in some institutions is done through interview and admission counseling or first come first serve basis. Research in Medicinal Chemistry has made significant contribution to further knowledge in the discipline in the past decade. The funding of research work has increased significantly specially with Government agencies, international firms and pharmaceutical companies investing resources in clinical research and drug invention. Also, since 2005 after the proliferation of patent regulations, medicinal chemistry research has been on rise in India. A number of research groups have been established both in academic and industrial laboratories. The Government agencies like Department of Science & Technology (DST), Council of Scientific and Industrial Research (CSIR) and Department of Biotechnology (DBT) show positive signs of scope in the field with substantial investing resources. The top recruiters for Ph.D. in Medicinal Chemistry scholars are Kinapse, India Scientific Services, Coromandel International, Ranbaxy Laboratories, Syngenta Biosciences, Biocon Ltd., Piramal, Lupin Pharmaceuticals Ltd., Torrent Pharmaceuticals, Sun Pharmaceuticals, Cadila Pharmaceuticals, Alembic Pharmaceuticals and Zydus Cadila Ltd.